Flagging sales and the rising cost of employee healthcare pushed General Motors to a net loss of $1.1bn (£576m) in the first three months of 2005. The world's biggest car maker warned in March it would drive deep into the red, but the loss - the worst since 1992 - is at the top end of its prediction. 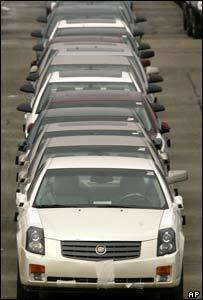 In the same period last year, GM made a profit of $1.2bn. The headline figure includes several one-off costs such as 12,000 layoffs in GM's operations in Europe. Its Opel and Saab units are having trouble turning a profit, while extricating itself from a deal which could have forced it to buy Fiat is also hurting the company. At one stage on Tuesday, shares in GM hit a low of $24.68, a level last reached in 1982. Shares closed down 10 cents, or 0.38%, at $26.09. Arch-rival Ford is to report results on Wednesday, which are also expected to disappoint. The North American market - the world's biggest - is the source of GM's biggest problems. With GM's Buick, Cadillac and Chevrolet cars losing out to foreign brands, chief executive Rick Wagoner took personal charge of daily operations there earlier this month. Sky-high oil prices are also causing the firm problems, and some analysts believe the US's long infatuation with gas-guzzling sports utility vehicles may be running out of steam. In addition, the firm had to recall almost 200,000 vehicles in the US in February because of a potential problem with the brake system, while a government watchdog is investigating reports of tailgates falling off GM pickup trucks. Losses in Europe were offset by $60m in profits from Asia as market share in Japan and China grew - although cut-throat competition and thinning margins meant profits in Asia were down more than 75%. "While most of our business units exceeded expectations, the results at GM North America were clearly disappointing," Mr Wagoner said. But he promised investors "well thought-out plans" to deal with the problems, including "aggressive" new model introductions and marketing. He also promised to tackle the company's huge healthcare costs - although so far negotiations with unions have failed to produce the results the firm wants. The overall loss - inflated thanks to the one-off costs - was moderated by sustained profits on financial dealings. Profits at both GM and Ford have been sustained in recent years only by the money they make not only on loans to customers to buy vehicles, but also on mortgages and insurance. GM Acceptance Corp, the unit responsible for financial services, made a profit of $728m, only slightly down from the $764m recorded in the first quarter of 2004.